Ameritemp Group sells and rents Accuc hiller EQ Series Portable Chillers feature nonferrous construction, a compact footprint with easily accessible interior and a microprocessor that provides precise temperature control and extensive diagnostics. Ameritemp Group sells and rents Versatile Accuchiller SQ Series Portable Chillers include encapsulated safety switches, scroll compressor, NEMA 12 control panel, nonferrous water system and one or two recessed exterior panels with lockable, flush-mounted, pull-ring latches. Ameritemp Group sells and rents NQ Series portable chillers use components such as R410A refrigerant, scroll compressors, micro-channel condensers, low noise fans, stainless steel brazed plate evaporators, and sophisticated controls provide the best available technologies for the ultimate performance and reliability in a chiller package. Tons based on 50°F leaving water, 95°F ambient air entering the condenser, R407c refrigerant, and operating at sea level. Standard set point range is 20°F to 65°F. To extend range to 20°F to 80°F the CPR valve option is required. MCA is Minimum Circuit Ampacity (for wire sizing). Model EQ3A01 is only available as a 230 volt, single-phase, 60-Hertz unit. The remote condenser is only available for use with 230/1/60 main power. 5.3 TON NQ Series portable chillers use components such as R410A refrigerant, scroll compressors, micro-channel condensers, low noise fans, stainless steel brazed plate evaporators, and sophisticated controls provide the best available technologies for the ultimate performance and reliability in a chiller package. 1Cooling tons based on 12,000 BTU/Hr/ton with 50F leaving coolant and 95F ambient air. 2Sound power shown is for standard high-efficiency constant-speed AC motor fans. A high-pressure variable-speed EC motor fan option is available for NQA08 and larger units which changes the sound pressure at 1 meter (dBA) to: 75 for NQA08-10, 82 for NQA15, 84 for NQA20, 85 for NQA25, and 82 for NQA30. 3Net available pressure at outlet of chiller is pump discharge pressure less internal coolant circuit pressure loss. 4MCA is minimum circuit amps (for wire sizing), complies with NEC, Section 430-24. 8.0 TON NQ Series portable chillers use components such as R410A refrigerant, scroll compressors, micro-channel condensers, low noise fans, stainless steel brazed plate evaporators, and sophisticated controls provide the best available technologies for the ultimate performance and reliability in a chiller package. 1Cooling tons based on 12,000 BTU/Hr/ton with 50F leaving coolant and 95F ambient air. 2Sound power shown is for standard high-efficiency constant-speed AC motor fans. A high-pressure variable-speed EC motor fan option is available for NQA08 and larger units which changes the sound pressure at 1 meter (dBA) to: 75 for NQA08-10, 82 for NQA15, 84 for NQA20, 85 for NQA25, and 82 for NQA30. 3Net available pressure at outlet of chiller is pump discharge pressure less internal coolant circuit pressure loss. 4MCA is minimum circuit amps (for wire sizing), complies with NEC, Section 430-24. 11.2 TON NQ Series portable chillers use components such as R410A refrigerant, scroll compressors, micro-channel condensers, low noise fans, stainless steel brazed plate evaporators, and sophisticated controls provide the best available technologies for the ultimate performance and reliability in a chiller package. 1Cooling tons based on 12,000 BTU/Hr/ton with 50F leaving coolant and 95F ambient air. 2Sound power shown is for standard high-efficiency constant-speed AC motor fans. A high-pressure variable-speed EC motor fan option is available for NQA08 and larger units which changes the sound pressure at 1 meter (dBA) to: 75 for NQA08-10, 82 for NQA15, 84 for NQA20, 85 for NQA25, and 82 for NQA30. 3Net available pressure at outlet of chiller is pump discharge pressure less internal coolant circuit pressure loss. 4MCA is minimum circuit amps (for wire sizing), complies with NEC, Section 430-24. 12.5 TON NQ Series portable chillers use components such as R410A refrigerant, scroll compressors, micro-channel condensers, low noise fans, stainless steel brazed plate evaporators, and sophisticated controls provide the best available technologies for the ultimate performance and reliability in a chiller package. 1Cooling tons based on 12,000 BTU/Hr/ton with 50F leaving coolant and 95F ambient air. 2Sound power shown is for standard high-efficiency constant-speed AC motor fans. A high-pressure variable-speed EC motor fan option is available for NQA08 and larger units which changes the sound pressure at 1 meter (dBA) to: 75 for NQA08-10, 82 for NQA15, 84 for NQA20, 85 for NQA25, and 82 for NQA30. 3Net available pressure at outlet of chiller is pump discharge pressure less internal coolant circuit pressure loss. 4MCA is minimum circuit amps (for wire sizing), complies with NEC, Section 430-24. 15.0 TON NQ Series portable chillers use components such as R410A refrigerant, scroll compressors, micro-channel condensers, low noise fans, stainless steel brazed plate evaporators, and sophisticated controls provide the best available technologies for the ultimate performance and reliability in a chiller package. 1Cooling tons based on 12,000 BTU/Hr/ton with 50F leaving coolant and 95F ambient air. 2Sound power shown is for standard high-efficiency constant-speed AC motor fans. A high-pressure variable-speed EC motor fan option is available for NQA08 and larger units which changes the sound pressure at 1 meter (dBA) to: 75 for NQA08-10, 82 for NQA15, 84 for NQA20, 85 for NQA25, and 82 for NQA30. 3Net available pressure at outlet of chiller is pump discharge pressure less internal coolant circuit pressure loss. 4MCA is minimum circuit amps (for wire sizing), complies with NEC, Section 430-24. 20.5 TON NQ Series portable chillers use components such as R410A refrigerant, scroll compressors, micro-channel condensers, low noise fans, stainless steel brazed plate evaporators, and sophisticated controls provide the best available technologies for the ultimate performance and reliability in a chiller package. 1Cooling tons based on 12,000 BTU/Hr/ton with 50F leaving coolant and 95F ambient air. 2Sound power shown is for standard high-efficiency constant-speed AC motor fans. A high-pressure variable-speed EC motor fan option is available for NQA08 and larger units which changes the sound pressure at 1 meter (dBA) to: 75 for NQA08-10, 82 for NQA15, 84 for NQA20, 85 for NQA25, and 82 for NQA30. 3Net available pressure at outlet of chiller is pump discharge pressure less internal coolant circuit pressure loss. 4MCA is minimum circuit amps (for wire sizing), complies with NEC, Section 430-24. 25.4 TON NQ Series portable chillers use components such as R410A refrigerant, scroll compressors, micro-channel condensers, low noise fans, stainless steel brazed plate evaporators, and sophisticated controls provide the best available technologies for the ultimate performance and reliability in a chiller package. 1Cooling tons based on 12,000 BTU/Hr/ton with 50F leaving coolant and 95F ambient air. 2Sound power shown is for standard high-efficiency constant-speed AC motor fans. A high-pressure variable-speed EC motor fan option is available for NQA08 and larger units which changes the sound pressure at 1 meter (dBA) to: 75 for NQA08-10, 82 for NQA15, 84 for NQA20, 85 for NQA25, and 82 for NQA30. 3Net available pressure at outlet of chiller is pump discharge pressure less internal coolant circuit pressure loss. 4MCA is minimum circuit amps (for wire sizing), complies with NEC, Section 430-24. 30.0 TON NQ Series portable chillers use components such as R410A refrigerant, scroll compressors, micro-channel condensers, low noise fans, stainless steel brazed plate evaporators, and sophisticated controls provide the best available technologies for the ultimate performance and reliability in a chiller package. 1Cooling tons based on 12,000 BTU/Hr/ton with 50F leaving coolant and 95F ambient air. 2Sound power shown is for standard high-efficiency constant-speed AC motor fans. A high-pressure variable-speed EC motor fan option is available for NQA08 and larger units which changes the sound pressure at 1 meter (dBA) to: 75 for NQA08-10, 82 for NQA15, 84 for NQA20, 85 for NQA25, and 82 for NQA30. 3Net available pressure at outlet of chiller is pump discharge pressure less internal coolant circuit pressure loss. 4MCA is minimum circuit amps (for wire sizing), complies with NEC, Section 430-24. 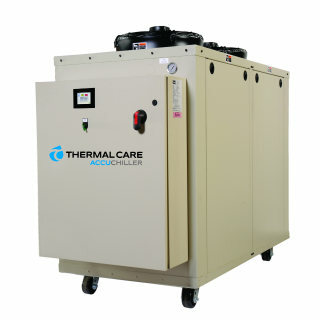 5.70 TON NQ Series portable chillers use components such as R410A refrigerant, scroll compressors, micro-channel condensers, low noise fans, stainless steel brazed plate evaporators, and sophisticated controls provide the best available technologies for the ultimate performance and reliability in a chiller package. 1 Cooling tons based on 12,000 BTU/Hr/ton with 50F leaving coolant and 85F condenser water. 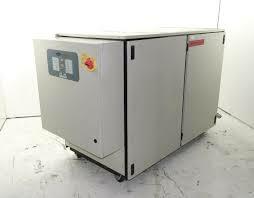 2Net available pressure at outlet of chiller is pump discharge pressure less internal coolant circuit pressure loss. 3MCA is minimum circuit amps (for wire sizing), complies with NEC, Section 430-24. 8.40 TON NQ Series portable chillers use components such as R410A refrigerant, scroll compressors, micro-channel condensers, low noise fans, stainless steel brazed plate evaporators, and sophisticated controls provide the best available technologies for the ultimate performance and reliability in a chiller package. 1Cooling tons based on 12,000 BTU/Hr/ton with 50F leaving coolant and 85F condenser water. 2Net available pressure at outlet of chiller is pump discharge pressure less internal coolant circuit pressure loss. 3MCA is minimum circuit amps (for wire sizing), complies with NEC, Section 430-24. 12.40 TON NQ Series portable chillers use components such as R410A refrigerant, scroll compressors, micro-channel condensers, low noise fans, stainless steel brazed plate evaporators, and sophisticated controls provide the best available technologies for the ultimate performance and reliability in a chiller package. 1Cooling tons based on 12,000 BTU/Hr/ton with 50F leaving coolant and 85F condenser water. 2Net available pressure at outlet of chiller is pump discharge pressure less internal coolant circuit pressure loss. 3MCA is minimum circuit amps (for wire sizing), complies with NEC, Section 430-24.